The health sector has a major need to improve efficiency in order to meet future requirements. 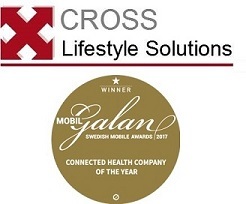 Cross Technology Solutions has developed LifePod®, which monitors the lifestyle of groups of patients at a distance. By analysing data from patients, including data from smartphones and wearables, LifePod® can pre-pack this patient information for health care and automatically prioritise patients’ actual care needs. LifePod® is an effective tool for moving from resource-heavy appointment-based care to needs-based care. Examples of patients are people with diabetes or myocardial infarction who need to change their lifestyle. Region Skåne actively supports LifePod®.